However, a bug tracking system can be more effective when incorporated with CRM software. In the article, we will tell how to integrate SugarCRM with Redmine for building reports on the time spent on the tasks assigned by the customer at SugarCRM portal. Obviously, data collection should be an ongoing process in order to respond promptly to negative changes. However, big data hinder manual carrying out of the task. So, our task on SugarCRM integration with Redmine is the following: we need to transmit customer’s tasks and related comments from SugarCRM portal to Redmine. Also it is needed to automate the process of transmitting time spent to SugarCRM from Redmine in order to build reports within SugarCRM and submit them to the customer. SugarCRM is famous for its flexible Rest API, using it we are going to get data. The things are different about Redmine – Redmine also has its own API, but it’s not that flexible and quick-operating. Mssql. The plugin through which we will transmit data to Redmine database. Mkdirp. We will create catalogues with utility reports. Underscore. A set of utilities to simplify the development. Winston. With this plugin we will log the utility working process. Node-Rest-Client. REST client for communication between Redmine and SugarCRM. Async. 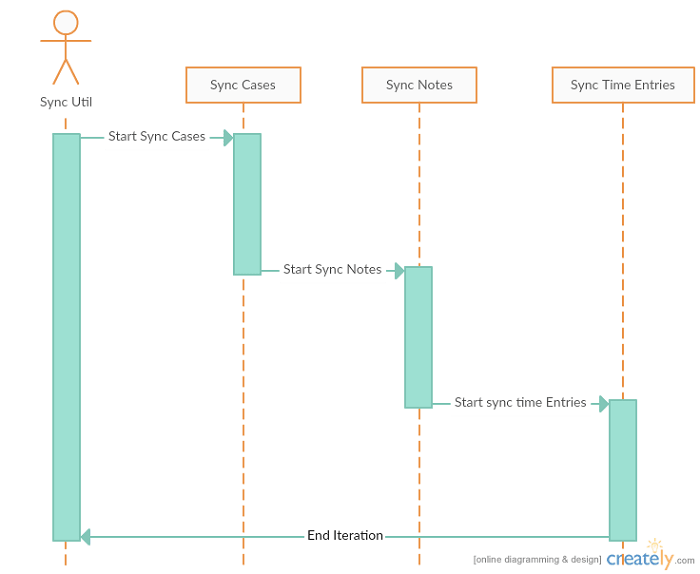 With this plugin we will ensure asynchronous actions to speed up the synchronization process. First and foremost, let’s install NodeJS. The information on its installation can be found on the Internet or on the official website. Let’s get down to creating our project. Firstly, let’s generate npm package: open the console, go to the catalogue where our project will be stored and run the npm install command. In the process we will be offered to insert name, version, comment, author, etc. to generate projects’ file (package.json). Let’s go back to the console. We will install plugins to the project npm install command. And finally, let’s create the utility itself. And the function that actually checks the session in SugarCRM, restores it in case of a loss or logs the error if the restoring fails. The things are similar with a set of utilities for Redmine, the utilities themselves serve to simplify the calls for receiving and sending data to the servers. Further we will call them when creating the scenario of synchronization sequence. Next we have to implement the algorithm of connection to servers and data processing. 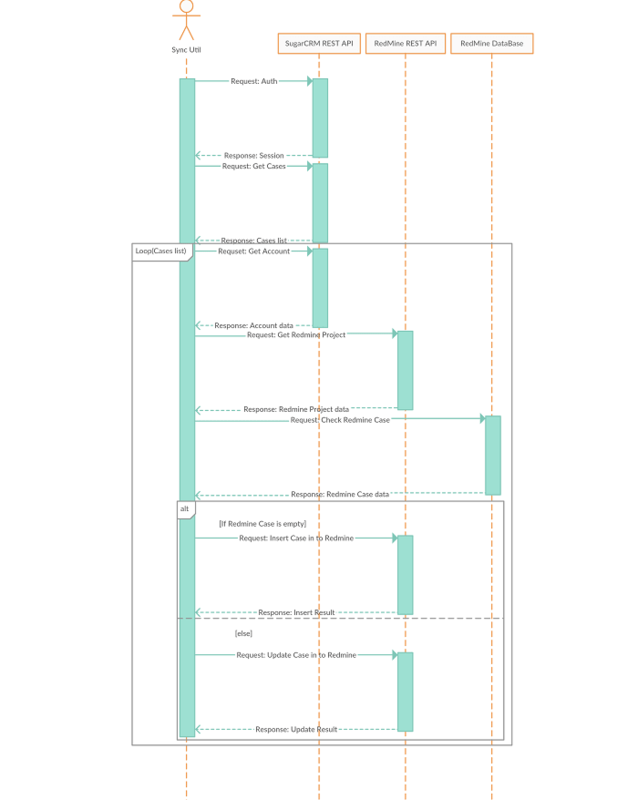 The algorithm example is provided in the sequence diagram below. Similarly is performed the sync process of the Spent time and Comments. When choosing a big volume of data the system can “freeze” or crash due to memory lack or “freezing” on the SugarCRM or RedmIne server side. In SugarCRM WEB service there is an opportunity to get these records in the number of 50 or more. It is done via GET /<module> request with parameters stated in the table below. max_num Integer Max number of records to be returned by the request. 20 by default. offset Integer Number of records that should be skipped. 0 by default. Somebody logged in SugarCRM under utility user, and the session has changed. The second copy of utility is run. The session is over (by default SugarCRM provides 1 hour per session). In order to solve the mentioned problem, the Token check has been implemented during each access to SugarCRM via synchronization utility. This enhancement has excluded Token malfunction, but the processes take more time too. See the diagram below. 4 logging levels that inform on the process: debug, info, warn and error, as well as logs that alert of utility fatal errors. The utility is realized on NodeJS, which instead of a traditional parallelism model based on streams, is implemented based on event-focused system. The model has been chosen due to its simplicity, low overheads and high performance. Relatively long data processing time. Restricted number of updatable fields. Limited functionality: FB «Tasks», «Comments» and «Spent time». 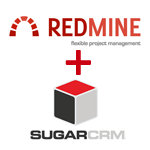 The SugarCRM integration with Redmine is based on the procedure model; it can be changed to object model, which will give a possibility to update more fields, to organize code in a better way, to simplify enhancement and testing. Add more flexible algorithm which will allow the user add more settings and restrict the functionality less. That’s it. 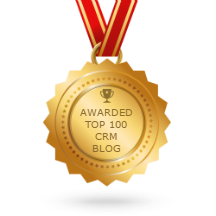 If you need an additional advice on SugarCRM integration with Redmine or other software – give us notice.